makin’ lovin’ in the oven…only easier. 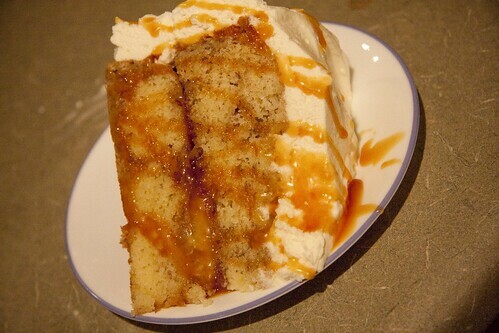 In my Martha cookbook is a Caramel Banana Cake with Mascarpone Frosting. Well guess what? I’m not giving you the recipe because the cake was kind of nasty. But everything about it’s creation was perfection. Why perfection? Because this was my first fancy cake with my fancy new Frigidaire Professional Series oven. I have cooked and baked and loved to cook and bake for years. I have won awards for baking. This is the first time I did some serious cooking with a high end stove. And yes. In all honesty I could tell an enormous difference. If you love to cook and have been cooking with your landlords entry level stove for the last ten years? Your entire kitchen life will change. If you like to cook occasionally but don’t live or die by sauteing and roasting? You’ll notice how much easier things become. 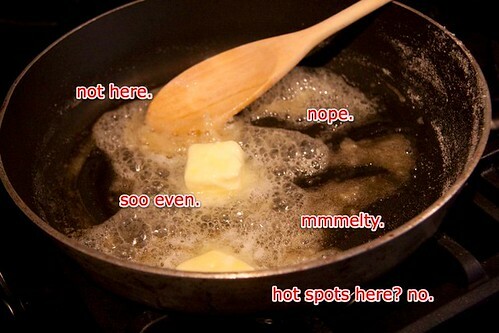 If you have every intention of learning how to cook? Starting with a nice stove will give you amazing confidence and an edge. So for those of you who “get” cooking? I give you reasons to spend that extra money on the professional series line. For those of you who don’t “get” cooking. Just imagine what the cake could have tasted like if it had tasted good. I’ve always been a snot about oven thermometers. 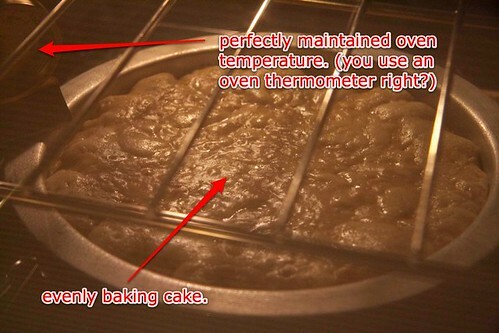 Mostly because I’ve always had a crappy oven that was off as much as 30 degrees in any direction. With this new oven? I just have the oven thermometer to rub in how spot on it is. No rotating cakes halfway through. Evenly baked. Even a really goopy thick cake like this banana mess. Next? The range. I chose the gas range. Anyone who likes to cook should technically prefer cooking with gas. Even heat. REAL FIRE! Melting butter on my old range? Turn away for a second and BURN BABY BURN. This new one? Perfect browning. No burning. 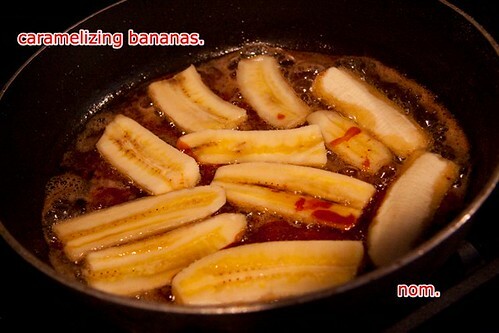 Which makes caramelizing bananas even easier. Almost too easy. Not even sure if caramelizing bananas is supposed to be easy or not. But it is with this stove. 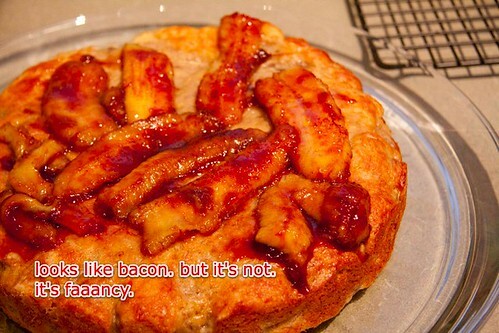 The bananas (which looked an awful lot like squiggly bacon) went between the layers of the cake. 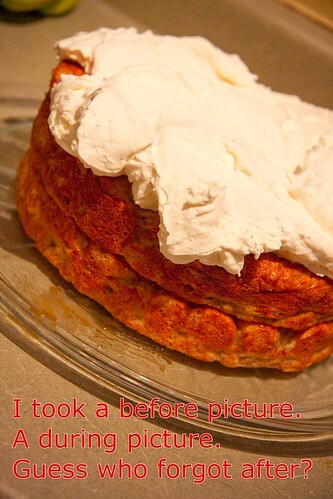 Then I smothered Mascarpone frosting all over the cake. Frosting makes everything better. Nothing burned, nothing overcooked and oh so much room for all of my biggest pots and pans. I must say this is one review that I would be doing in my head even if I hadn’t received these appliances (yes, for free) from Fridigaire to review. I hope you can trust me when I say I take this review SEER-EE-US-LEE. Seriously jealous! As in the drooling type of jealousy! And all I can say about the simmer burners, boil burners, regular burners is… Huh? @Olivia, It’s like having three different calculators. Basic. Fancy. And can do your taxes. I don’t use the m word either. I think it’s in the top five most disgusting words in the English language. The cake is super pretty. Sorry it wasn’t tasty. Was the frosting good? @Kim, The frosting may have been the worst part. it was kinda nasty? That is so sad! Looks like something I would want to eat while I watch the Biggest Loser. @designHer Momma, I’m not even sure the Biggest Loser people would have eaten it. Not worth the calories. Wait, have we talked about this before? I HATE THE M WORD!!! It makes me dry heave. I also hate her evil cousin, the C word, as in cre*my. GAG. Also, I covet your oven. Our new-to-us house has one of those crappy flat-top electric ranges. It makes me want to cry every time I use it. @Jen L., I used a flat top for the first month we lived here. I did cry every time I used it. We have a flat-top in the house we’re buying, WAH!! I hate those things. Does this mean you will have to give the oven back? I hope they let you keep them! I’d love one sent my way (how about doing a giveaway for one?). @Mindy, It’s mine to keep! Frigidaire is giving away a washer and dryer…does that help? I need these appliances in my house! I am so jealous! I don’t love to cook, but I like it. I think if I had a better oven/range I would do it more happily. It is on our list of things to do, but man that list is LONG! I am glad I have a dishwasher. I have done enough dishes by hand to last me a LIFETIME. @Jenny, I write our new dishwasher love letters. And yes, cooking in an oven that you know works? Makes a HUGE difference. I’ve had mine for two days and I’m too scared to use it. By “it,” I mean the microwave. The oven? I should not be allowed to be in the vicinity of such a piece of equipment. Also, what in the world does “slide a peel full of dough onto your baking stone” mean??? @Emily from Mommin It Up, Thank you I was wondering what “slide a peel full of dough onto your baking stone” meant too. @mommabird2345, I answered Emily below…not sure how to answer both at the same time. fail. 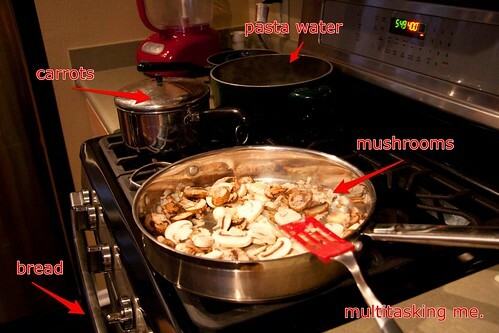 @Emily from Mommin It Up, The microwave is just as foolproof as the oven. Promise. Read the manual. Pay attention to the little list on the inside. Want me to come to Dayton for lessons!? @Emily from Mommin It Up, A peel is a big (BIG!) flat wooden spatula used for getting dough straight onto a baking stone. You know when they slide pizza into those brick ovens with the big wooden flat thing? That’s a peel. I use the stone as my pan when I make bread or pizza. It makes stuff crispier and chewier. @DWJ, I was seriously blessed to have this opportunity, it freed up our appliance budget to get a nicer dishwasher and fridge. At least I can promise you that an investment in good appliances IS worth it seeing as I’m right there with you with loving to cook and loving to save money. Why eat out when you can make it better (and cheaper) at home? What is the M word? Love your oven. What kind of cake pans are those? I still use my grandmothers. They are Airbake pans. They’re double layered with a pocket of air in the middle. A little more tricky to wash but as far as baking they’re foolproof. But if your grandmothers are those heavy metal kind? You can’t go wrong there either. It’s the flimsy ones that chip that I can’t stand. Why didn’t the cake taste good? It looks yummy. @mommabird2345, Eh, it tasted like really weak banana bread, which is what I should have made. And the frosting wasn’t sweet enough to compliment the cake so it was just kind of a big let down. 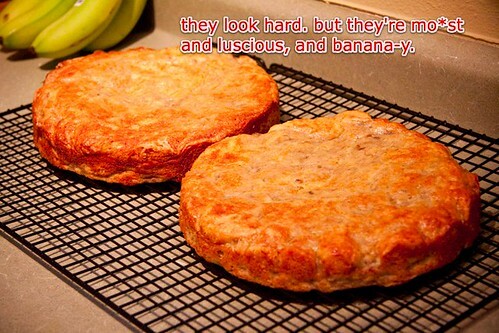 Oh Casey, the pictures of the cake look so good (although I’m not a fan of bananas). I think anything you make would be perfection. Miss you. So wait – the cake was bad?! That seriously almost ruined my whole night. And now I want to go bake a cake. You know… if you have any of this nasty cake left over… I’d be happy to take it off your hands. Even if it’s gross… I mean… can cake be gross? I don’t believe you. It makes cooking fun doesn’t it? I might actually get good at it…! 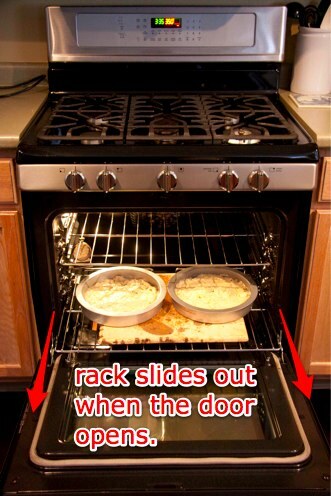 a rack that comes out when you open the oven… GENIUS. too bad only the rich can afford such a thing. I could probably NOT be on Weight Watchers for a while to eat some of that cake. YUMMMMM. Mmmm yummy! I want! I need to go to bed. It’s 11:20 and now i wanna bake.